I used to make fun of this. 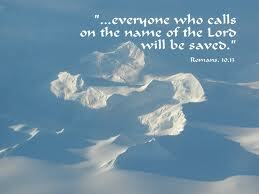 I used to shake my head in wonder that anyone believed they were saved to begin with. I would listen skeptically, nod and smile, then behind their backs go off on a tirade about how just saying "Sorry, let me take a mulligan" didn't put you back in good graces with God. It didn't change your life. There was no assurance whether there even was a Heaven or Hell, much less which place you might be going. But you can bet your boots (who even says that!?) that, either way, just asking for it wasn't going to get you there. You know what else I used to do? Never admit I was wrong. If you read the last few posts, I shared a bit about how I ended up on my knees sobbing, begging God to fix the incredible mess I had made of my life. I told Him what He already knew: that I had made more mistakes than I could count, that I couldn't even name them all because I couldn't remember them, that I couldn't right my own wrongs, that I couldn't go on living the way I was, and that I needed Him to just take it all and forgive me, and help me to start over. That's exactly what He did, and in a split second. July 12, 2004. I guess that makes me officially eight years old. I know some eight-year-olds. They're eager and exuberant but also somewhat sarcastic and jaded already. They know some things, but there's a lot they don't know. There is a lot they have to learn yet, and people around to teach them. They experience happiness quite often, but they also experience a great deal of disappointment. But all in all, life is good, and I thank God every day for that.